ARE YOU STRUGGLING WITH YOUR FOREX TRADING? If you have been a struggling trader…you have to change! That may sound ridiculously obvious but the shocking fact is that most people continue down a losing path, numb to the fact that their results will simply continue as they have been. The fact is, we’re all wired a little differently. And this is exactly why our Coach’s Corner mentors, Darko Ali, and Vic Noble have partnered up to provide personal coaching for those who truly understand the need to change what they’re doing. Darko and Vic will assess your individual, unique situation during a live session, and you will be provided with a trading plan that is just for YOU – nobody else. A plan that fits your personality, your lifestyle and your trading goals. You will find our trading approach dead simple, yet highly effective in revealing high-odds trading opportunities. Our goal is that you leave the session with a crystal clear understanding of exactly what you need to do going forward. You have spent a lot of time and money and have been overwhelmed with far too much information, leaving you frustrated with the whole trading game! You have spent many years trading, with only mixed results at best, and find yourself constantly looking for “something better”. (You are probably much closer than you think to turning your trading around to the positive). You have a good basic understanding of your charts and your dealing platform, and how to use both easily. (This service is not for complete beginners). We will make a complete and full assessment of where you’re at, and how you’re going to get to the next level. This is done through a series of questions and answers that will help us nail down exactly how to help you in the best, most efficient way. You will leave your coaching session with no doubt about what you are going to be doing. No matter what we do, or what we say, the final verdict on your trading will be determined by you. We will be following up with you for an entire month, and we have very specific requirements of you that are critical to your success. We are 100% committed to seeing you succeed, but…you need to be committed as well. We need to work together – that’s the whole idea! We use GoToWebinar to conduct the session, and it is required that you have a headset with a microphone attached so that we can speak clearly to each other. Laptop speakers may be ok as well, but please try them out first to confirm good sound quality. Although the session can be done one-on-one, we will allow a maximum of 2 people in a session. Consider this: other traders’ stories (problems) can be advantageous for you to hear. 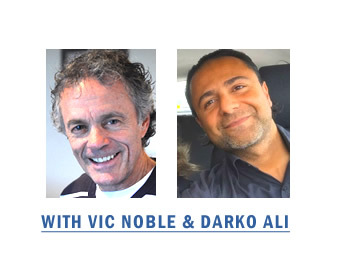 And that’s because the challenges others have are very, very common, and by hearing Darko and Vic cover their problems, it will help you identify and eliminate issues that you, too may be having. Issues that you may not have even thought about. USD $399. The session could last up to 2 hours, but generally we shouldn’t need that long. And of course in addition, we will provide follow up support. To help you become a consistently profitable trader. I have had a few other "coaching sessions" in the past from so-called Forex "experts," but never one like this. Darko's direct approach, where he set forth very strict guidelines and parameters tailor-made for me was unlike anything I've experienced in the past. I felt like I was really being coached, not only by people who care, but who also know their stuff. Darko was not satisfied to end our session until he was sure I understood everything I am supposed to do. Both you guys were patient and more than willing to answer all my questions. You guys are a real "dynamic duo." Personalized attention, a tailor-made trading plan (very clear, very simple), being told what to do right down to the very letter, having a plan of action at the end, combined with ongoing support and encouragement---all of these make the time and money worthwhile. In fact, it's a bargain. I've been studying Forex since 2009 under a host of "mentors," so I know what I'm talking about. You guys really are the best.